India’s largest crowdfunding site. Over Rs.546.52 Crores raised. NGO Jan Sharnam has its free shiksha kendra running currently in Kanpur, Rae Bareli and Noida with a total of 230 children. We lack even the basic amenities in our centre but the motivation to educate children with quality education and personality development has encouraged us to run these free shiksha kendra centres daily. 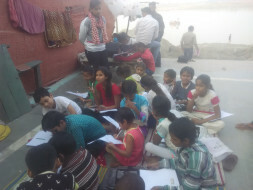 People who have a like mindset that education is the only asset through which the future of India the children lives can be changed please join us and support our mission Jan Sharnam. Extension, maintenance, and construction of new and existing premises/ campus. 3. Join our voluntary group. 4. Provide your valuable services and products at concessional rate or free of cost. We earnestly appeal to you to render financial assistance to us. Each time you donate you would be helping to brighten the life of these children’s. We assure every single rupee donated by you will be put to proper use.